Now you can walk with confidence and ease, whether it's day or night, with the Drive Medical Adjustable Lightweight Folding Cane with Glow Grip Handle. 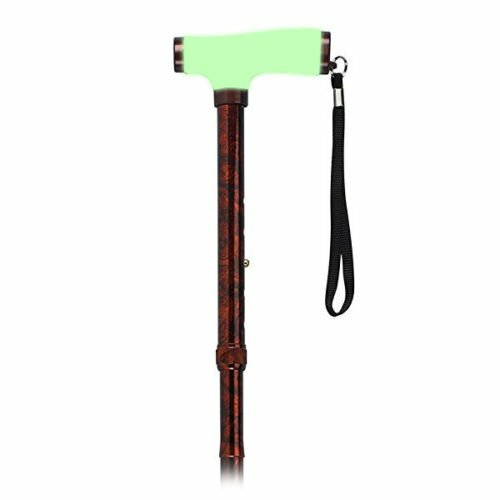 This cane is perfect for those with limited mobility who appreciate having a bit more visibility for safely crossing poorly-lit streets or dark corners. That's because the cane features a glow-in-the-dark handle and tip! Simply place the cane in sunlight for 45 minutes and enjoy up to 6 to 8 hours of glowing. The cane features an adjustable handle height between 33" to 37" and is made from sturdy, 7/8" diameter anodized, extruded aluminum tubing. Plus, it offers a fold-up design, which makes it convenient for folding up and tucking inside a bag at the movies, at dinner, and more.